Thanks to the efforts of celebrities like Paul McCartney and Oprah, you’ve likely heard the term “Meatless Monday”. This international movement with the simple message of “once a week, cut the meat” has spread to over 30 countries and has been recently picking up steam here in Metro Vancouver. As a food reporter and ethical-eating advocate, I’m passionate about connecting Vancouverites with food education initiatives and as such, I was eager to chat about Meatless Monday with the Vancouver Humane Society (VHS), who is helping lead the charge locally. I spoke recently with Emily Pickett, VHS’s Meatless Monday Program Coordinator, to find out more and learn how each of us can take part. Me: While the name seems pretty self-explanatory, can you tell us a bit more about the Meatless Monday movement? Emily: Meatless Monday aims to empower individuals, businesses and entire communities to reduce meat consumption in an effort to protect animal welfare, individual and public health, the environment and to save money. When it comes to per capita meat consumption rates, Canada ranks among the highest in the world, so we can have a significant impact simply by being conscious of what we choose to put on our plate. Me: What are the repercussions of our society’s overconsumption of meat? Emily: Our insatiable demand for meat results in over 700 million animals being raised and killed for food every year in Canada. The vast majority of them live in unnatural environments, characterized by cruelty and confinement. Health-wise, going meatless even once a week reduces our risk of conditions like cancer, cardiovascular disease, diabetes, and obesity. Meat production also has a serious impact on the planet. The industry is responsible for more greenhouse gas emissions than the entire transportation sector combined and is a major contributor to climate change and virtually every other environmental ill facing the planet. Finally, plant-based proteins are typically more affordable than animal-based proteins, making eating meatless easier on the budget as well. Me: What has the response been like, locally, to the Meatless Monday concept? Emily: Vancouverites have been very open and receptive to the message. Since 2015, when we first launched VHS’s Meatless Monday campaign, we’ve supported several schools in starting up their own initiatives, including Langara College, British Columbia Institute of Technology, Eric Hamber Secondary and Winston Churchill Secondary. We also encouraged the Vancouver Food Policy Council to pass a motion endorsing Meatless Monday, which they did in the spring of 2016. The campaign itself focuses on some very timely and crucial social issues and so there really is huge potential for growth. Me: On that note, what’s next for Meatless Monday in Vancouver? Emily: Our goal is to expand the reach of this positive and impactful initiative and so we’re inviting the Vancouver restaurant community to join the movement! Our local dining scene is world-class, with prominent restaurants and talented chefs constantly raising the bar when it comes to creative and diverse dishes. Participating in Meatless Monday, which can be as simple as offering a plant-based special on Mondays, has many benefits. From reducing costs, to showcasing your chef’s culinary talents and reaching a new customer base, to reflecting your commitment to protecting animal welfare, public health and environmental sustainability, and generating media coverage – there are so many great reasons to take part. Me: What are some ways restaurants can participate? Emily: Meatless Monday is a flexible initiative – it’s easy for everyone to join in! Participating restaurants can highlight existing plant-based recipes on Mondays or add new ones to their menu. You don’t need to remove meat from your menu, although you certainly can if you’d like! Join top chefs like Mario Batali, Sarah Moulton and Ivy Stark, along with renowned restaurants like Almond NYC, Dovetail NYC and Dos Caminos in celebrating Meatless Monday. Get in touch with us at VHS for tips, recipe ideas and for help promoting your initiative (emily@vancouverhumanesociety.bc.ca). Me: What can each of us do to contribute on an individual level? Emily: Setting a positive example for our family, friends and coworkers by choosing to eat meatless on Mondays is a great place to start. Take VHS’s Meatless Monday pledge for weekly recipes you can try out yourself and share with others. Get in touch with VHS to discuss ways your workplace or school can implement their own initiative. Finally, share this article with your favourite restaurants and encourage them to take part! Every meal matters and each time we sit down to eat, we have the chance to stand up for a kinder, cleaner and healthier world. 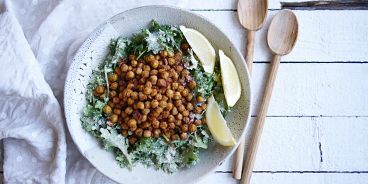 Get in touch with me at emily@vancouverhumanesociety.bc.ca to learn more and check out my list of favourite plant-based recipe cookbooks and blogs here if you’re needing inspiration in the kitchen.